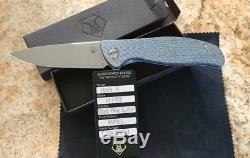 NIB Shirogorov Hati (3 bears version). Runs on MRBS (multi row bearing system), milled titanium interior frame for reduced weight. Great M390 blade steel, 3d milled titanium pocket clip (grey tone), blue annodized framelock, gorgeous blue carbon fiber twill scale, milled / textured titanium backspacer (grey). Blade is a functional flat grind, with a nice milled cutout and jimping. Action is smooth as glass, opens with a thwack, closes insanely smooth and detent and lockup are perfect. This model is very rare and lightweight. It was never carried and has a razor sharp edge with a beautiful mirror polish. Hard to part with this one, but too nice for me to actually use as an EDC... Wife gave it to me for Christmas, sorry to see it go. The item "Shirogorov Hati R (3 Bears Version) Blue Carbon Fiber Twill, M390 NIB" is in sale since Friday, February 09, 2018. This item is in the category "Collectibles\Knives, Swords & Blades\Collectible Folding Knives\Modern Folding Knives\Factory Manufactured". The seller is "choicepistolgripssd" and is located in San Diego, California. This item can be shipped to North, South, or Latin America.